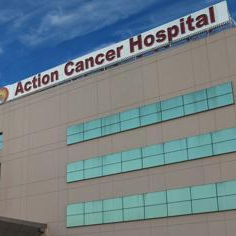 Action Cancer Hospital, the first complete cancer care facility in National Capital Region of India was established by Lala Mange Ram Aggarwal in 2010. A super-specialty cancer research centre, the 100-beds hospital offers cancer treatment to a host of patients from European, African, American and South Eastern countries. A hospital with a mission to provide world-class affordable healthcare facilities to all sections of society with a human touch, an ethical outlook and a will to outperform expected levels professional competency makes the hospital an outstanding cancer treatment centre. Action Cancer Hospital in Delhi offers treatment to all forms of cancer regardless of stage and medical history of the patients. Cancer patients can expect the best inpatient and outpatient care with the hospital. It provides hormonal therapy, hemotherapy, targeted therapy, supportive care and bone marrow transplant. World-class oncology services for the treatment and cure for terminal cancers is what the hospital offers under its Surgical Oncology specialisation. The focus is not on cure alone, but on improving the quality of life for patients. The highly advanced unit of the hospital uses high energy radiation and is managed by expert radiation oncologists, technologists, medical physicists and trained nurses. Preventive as well as curative treatments are provided for gynaecological cancers. Comprehensive care is provided by a team of highly experienced doctors. Special attention is given to cancer awareness programs and preventive measures. Primary and secondary tumors of the nerves are treated by well-known neuro surgeons. Cancer of the nervous system may affect brain, spine and nerves. From head to toe, the highly experienced plastic surgeons, perform routine and advanced surgeries including Rhinoplasty, Maxillofacial surgery, limb reconstructive surgery, to name a few. The state of art PET CT and Dual Head Camera in the Department of radio-isotope is one of the most advanced equipment to detect presence of cancer at the functional level. The hospital Radio Diagnostic and Bio Imaging Department offers a wide range of facilities which include, CT 64 Slice Scan, Bone Densitometry, Signa HDxT 1.5 t 16 channels, amongst others. Action Cancer Hospital, is fully NABH-accredited and is a trusted and tested Cancer treatment centre in the country. As is mentioned in numerous Action Cancer Hospital Reviews, it is a dependable, cost-effective and ideal Cancer treatment centre in terms of technology, knowledge and expertise in the National Capital Region of India.